The PVM-740 is a professional monitor with a large OLED display. It can be used for all sorts of monitoring applications (studio editing, post-production, etc.). Sony say it is ideal to use in a 3D camera setup. 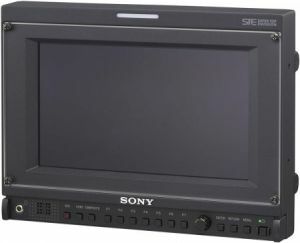 The PVM-740 is equipped with standard interface connectors: a composite video, a 3G/HD/SD-SDI, and an HDMI interface. The PVM-740 is shipping for around $2,700 (and £2,500 in the UK). Check out this short video of a Sony rep talking about this monitor.